Spring has sprung in my garden, it’s now official as the big oak tree behind our house has leafed out. We added soil to our garden plot and are planting vegetables and herbs this weekend. Just for fun I’m adding a few sunflowers to go along with tomatoes, cucumbers, peppers, scallions, zucchini, tomatillos,sweet basil and the list goes on. I bought the broccoli and Alaskan halibut for my dinner at Whole Foods which is expensive but really offers so much more than the average grocery store shopping experience. Walking from the vegetables to the the fish counter I noticed the coolest looking large size seed packets with the most beautiful colorful drawings on the front. As I was checking them out and daydreaming about Summer the door to the patio opened, a cool wind blew in over me bringing me back to reality, brrrr, we’re not quite there yet. But I think planning for the garden is at least half the fun. The broccoli looked good all stacked up and nestled into a beautiful display of vegetables. I grabbed a large bunch for my French Fridays With Dorie recipe and finally made it over to the fish counter, so many distractions on the way, like the carrot cake cupcakes in the bakery display which somehow found their way into my basket. I should have taken a picture of the cupcakes, they were so cute with a tiny carrot made out of icing on top of a small mound of piped cream cheese icing. Okay that was a decadent treat but I was good later, I did have halibut with broccoli for dinner. This week’s recipe from Around My French Table by Dorie Greenspan is another keeper and could be easily worked into a dinner menu on a regular basis. This week I served the garlicky crumb-coated broccoli with halibut and a green olive, almond, preserved lime relish. I’m not allowed to give you the recipe for the broccoli, you’ll have to buy the book. But this week as a special bonus to my readers I’m giving you my relish recipe for the halibut. 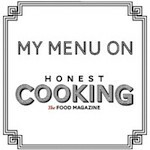 I’m feeling so generous today, I’m also going to include the link to all the other contributing Doristas here and my recipe for the Preserved Key Limes with Jalapeno Peppers that go into my relish for the halibut. The garlicky crumb-coated broccoli is a simple and delicious way to prepare fresh broccoli. Dorie suggests serving it with an omelet but I immediately thought of it with halibut and a flavorful relish. Place all the ingredients except lemon juice and olive oil in the bowl of a food processor and pulse a few times. Add the lemon juice and olive oil while continuing to pulse until a thick paste is formed. Set aside to rest. This relish is best served at room temperature with the halibut. I prepared the halibut by removing the skin from the fillets, using a paper towel to dry them off, covering with sea salt, pepper and a very slight sprinkling of sugar, to help with achieving a quick browning. I used a lightly oiled hot frying pan, for a quick sear, about 1-2 minutes on one side, flipped over the fillets and finished up in a hot, 425 degree oven for about 7-9 minutes, depending on the thickness of your fillets. I find this cooking method for fish fillets to be an easy foolproof way to prepare them quickly without overcooking and drying them out. I actually cut back on the butter in the broccoli recipe, imagine that, and it was still absolutely delicious with the garlicky bread crumbs. You know, I never wanted a garden before, but ever since falling in love with cooking, all I want to do is turn my whole backyard into a garden. If I dint have kids, I might have already done so. Kids need their space to run around in the backyard though, keeps me sane. Haha. I envy all the stuff you've got planting in your garden! I think sunflowers are so gorgeous. Boy is somebody going to have a great garden this summer. Oh, I am the worst at getting distracted in a grocery store. I'll go in just to get oranges, but come out with half a week's of grocery. Hubby says he comes along to help me with the bags now, but I think it's to keep an eye on me. Teehee. I love that you served the broccoli with halibut rather than an omelet, my kinda girl. This meal looks wonderful and healthy. I'm a garlic lover so I'm loving your relish and garlicy bread crumbs on the broccoli. What a superb way to treat that beautiful piece of halibut right with your lovely relish. Thank you for sharing your recipe with us. And Eclairs or not, I'd still come back. Although Eclairs is good too :-D. Have a beautiful weekend, dear! A marvelous dish! Those flavors are wonderful. A meal I could really love, fresh and gorgeous. Absolutely beautiful, Patty! Great photos! P.S. yes, let's meet for coffee sometime! Mmm…you're right about that Whole Foods broccoli, it looks like it's bursting with goodness underneath all the breadcrumbs. And many thanks for the extra recipes, you're mighty generous! I like the light on your photos. The halibut sounds wonderful, too! Your picture is amazing. I love those WFoods carrot cupcakes (and all their other cupcakes) too. I thought fish was a natural with this and debated between halibut and swordfish…stunning photos. Have fun planting your garden this weekend, and I love the idea of a few sunflowers in there! I'll bet this was great with the halibut. It looks fantastic. I agree about the Whole Foods shopping experience. I was just there tonight, and they have the marketing down to a science. Everything looks so wholesome and healthy and hard not to buy and bring home. I miss having Whole Foods (and Trader Joes' for that matter) from the months my husband spent in NJ working on a special work project. At this time I'm growing mostly herbs and tomatoes, but your list kind is inspiring me to try other things as well. Beautiful broccoli and that relish looks absolutely divine. I love broccoli and this looks terrific coated with crumbly garlic. Your photos are so beautiful! I think halibut would go really well with the broccoli and thanks for sharing the relish recipe – it sounds delicious. Such a simple yet healthy recipe, Pacheo! Love the beautiful color of Broccoli. Many things seem to find their way into my basket while I am shopping as well Love Whole Foods. Your relish is delightful, as is the entire dish. Some buttery, garlic bread crumbs dress up the broccoli just fine, but I'm loving your preserved lime relish! Now you know I love eclairs…but I must say that this looks just as divine as those tasty treats. I love broccoli, but I don't do much with it. Usually just some lemon and red pepper. I have to try this! Thank you so much for sharing your words and creativity with me tonight. During good times and bad, your blog always offers me a dose of joy. I hope you have a blessed and happy Sunday, my friend. Hugs from Austin! Yours look the BEST! Gorgeous photos. I've seen the dish on a few other participating blogs, and I love your pairing (fresh, light…the very essence of French-inspired California cooking). I love garlic and I love the way you broccoli with the crumbly garlic. 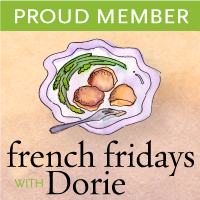 Patty I'm really enjoying all of your French Fridays with Dorie. Will definitely be back for the eclairs,mmm. The broccoli looks perfect, as does the halibut and relish. You are making wish it was summer but I'll settle for the nice spring weather. Your garden is going to look great and all of those fresh produce, yummy. Thank you for the lovely meal…and yes, I agree with having seared the fish before continuing the baking process.